In our family it is tradition to have Chinese food once a week. Usually it is one of our two take out nights (the other is pizza). Chinese food can be a little pricey, however, so at least once a month we make it from scratch. Our go to is pork or chicken stir fry and fried rice. 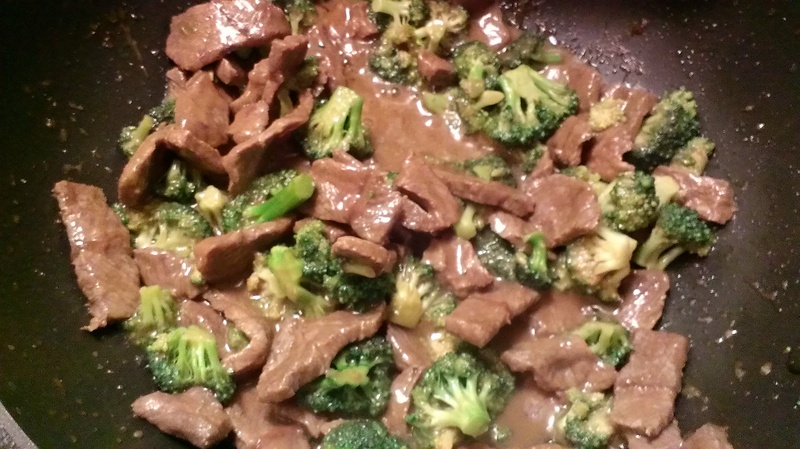 But we found some inexpensive flank steak at the supermarket recently, so thought I’d try my hand at broccoli beef. It was a big hit, so I wanted to share the recipe with you. Partially freeze the flank steak. This will make it much easier to slice. Slice it across the grain into 1/4 inch thick slices. Wash broccoli and slice on an angle (if necessary – I used a bag of precut florets, so didn’t have to slice them much). Combine soy sauce, cornstarch, sherry and honey. Add the beef, cover and let marinate in the refrigerator for about 30 minutes. In a skillet, heat the olive oil and broccoli. Cook and stir until the broccoli is light green, about 2 minutes. Transfer broccoli to a plate. Add beef and sauce to the skillet. Saute’ for 5-7 minutes, until meat is cooked through, then return broccoli to the pan and stir.